My look from Day 3 in Austin. 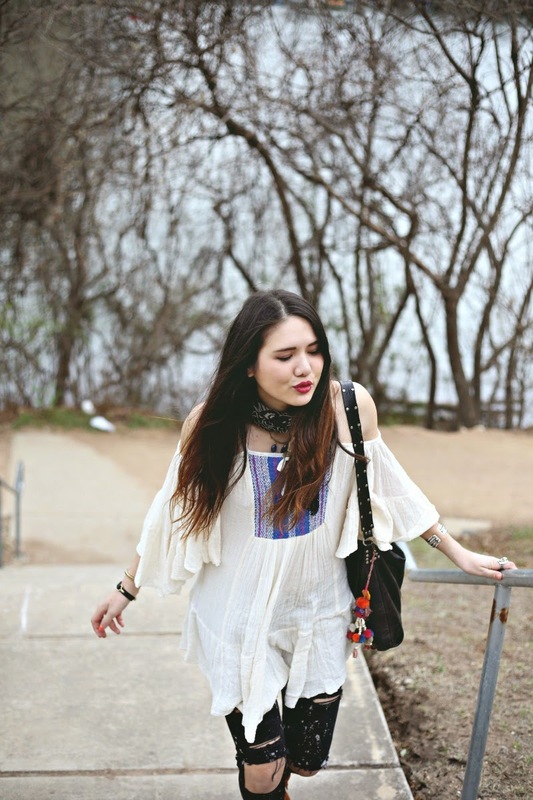 I was feeling the boho vibes for sure. But really, when am I not? The weather was nearly summer status this day, so I decided to go with the cold shoulder look. Not to mention, I've been rocking this scarf tight around my neck a lot in Austin. The Southwest really must have been rubbing off on me in the right way! The streets were insanely crowded in the center of Austin, but we found this peaceful park near the bridge to quickly shoot at before heading to the shows. I nice few minutes of breathing room before jumping into it all again. This day we saw bands play at the NYLON day shows, Hotel Vegas on East 6th Street and then back again on the west side of town for TIGI's SXSW shows at Textile where we saw Bad Things (Sean White's band!!!!) and NYC band Skaters. So much rock and roll in one day, it was fabulous. More pictures to come from Austin . . .
what a lovely top love it you rock this look! 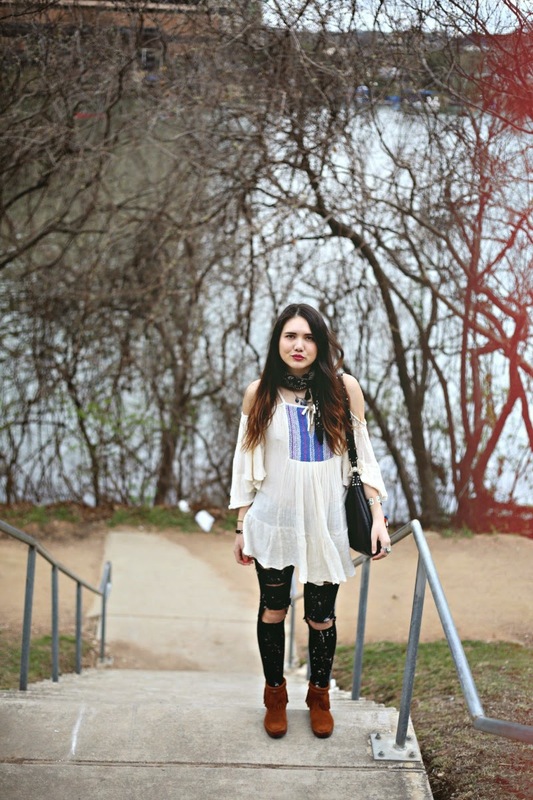 Great look and boots! Must dig out mine asap! Gorgeous, as always :) Fantastic jeans! love the flare of your top! 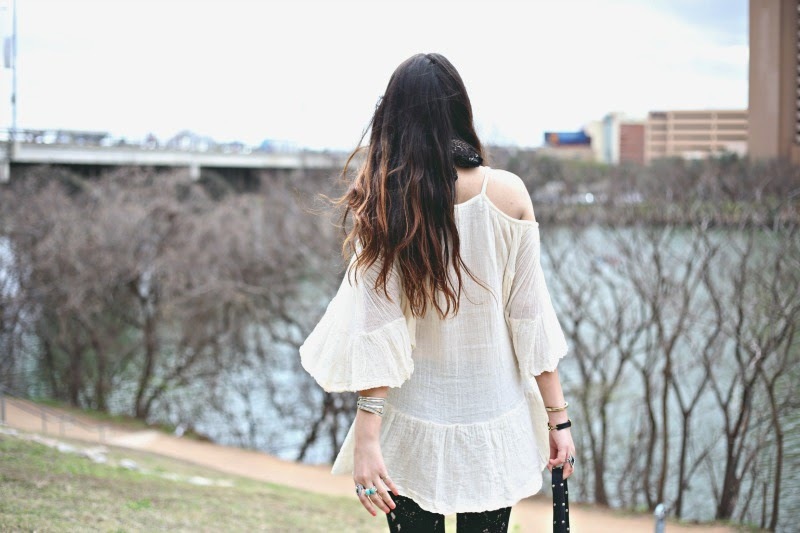 Adore the tunic! So pretty. I love the scarf! Such a great accessory. Sounds like SXSW was so much fun!